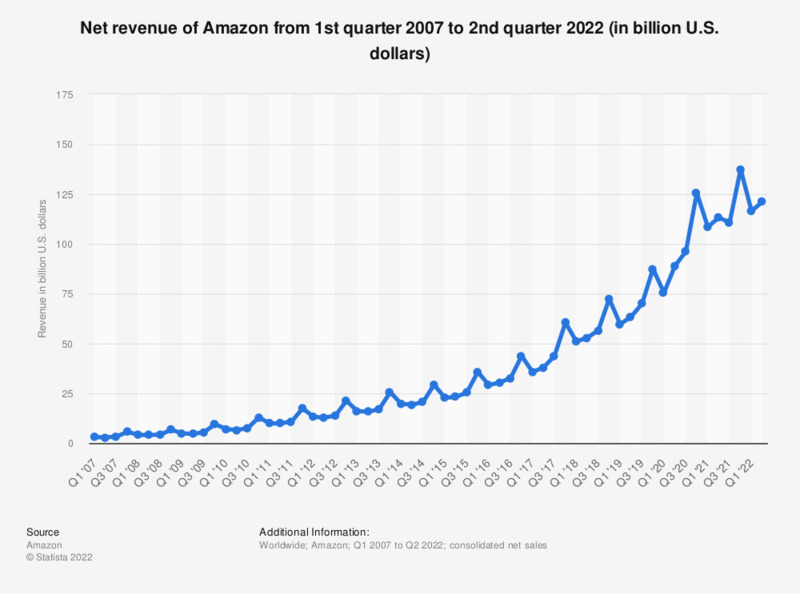 This statistic contains data on the quarterly revenue of Amazon.com from the first quarter of 2007 to the fourth quarter of 2018. During the last reported quarter, the e-commerce company generated total net sales of almost 72.38 billion U.S. dollars, up from 60.5 billion dollars in the preceding quarter. Launched in 1995 in the United States as an online bookshop, Amazon has grown into an international e-commerce company with separate retail websites in North America for the United States and Canada. In Europe, the United Kingdom, France, Germany, Italy and Spain all have their own Amazon sites, as do Australia, Brazil, Japan, China, India and Mexico. As a result Amazon’s audience reach in selected global markets is substantial. As of the second quarter in 2016, 82 percent of internet users in the United Kingdom had accessed Amazon’s e-retailing services in the past month. The United Kingdom has the second-highest share of any other market worldwide. Ahead of the United Kingdom came India with a 89 percent share of internet users. The United States ranked fourth with an Amazon market reach of 81 percent of online users. As of October 2018, Amazon.com had generated over 2.4 billion website visits across all devices. Desktop computers and laptops still remain the most popular purchase channels for U.S. Amazon buyers but considering the growth of mobile shopping, mobile Amazon shopping is set to overtake the traditional desktop purchase route.